Bishop Emeritus Eugene J. Gerber died Saturday, Sept. 29 after complications from a heart attack, hospital officials said. Gerber was 87 years old. 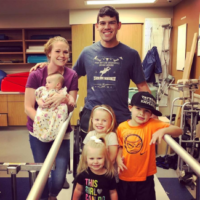 Gerber was driving on the evening of Sept. 26 when the medical emergency happened, causing his SUV to veer off the road and strike a bridge pillar and then a barrier wall. He was taken to Via Christi Hospital St. Francis where he died a few days after the accident. The Newman community was saddened to hear the news of Gerber’s accident. Gerber was appointed the eighth bishop of the Catholic Diocese of Wichita in November 1982 and officially installed in February 1983. 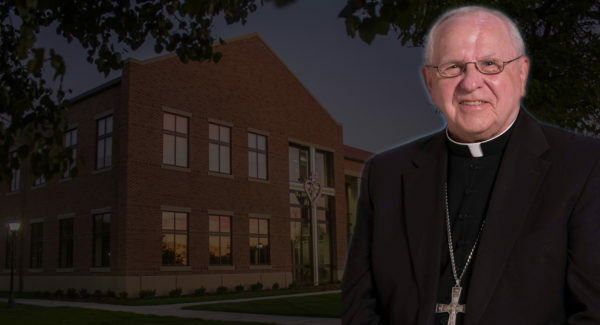 His services during his time as bishop include: serving on numerous committees for the National Council of Catholic Bishops as well as the board of directors for the Wichita Urban League, the board of Via Christi Health Systems, HopeNet, Kansas Foodbank Warehouse Inc. and Wichita Grand Opera. A new science center at Newman University was recently dedicated in his honor. Hundreds of community members, supporters and friends gathered outside the building to celebrate the opening of the state-of-the-art facility. “We are blessed to have in the Bishop Gerber Science Center wonderful spaces and places for our excellent faculty to challenge and support generations of students to come,” said Carrocci at the dedication. Bishop Emeritus Eugene J. Gerber and Father John Fogliasso prepare for the blessing of the Bishop Gerber Science Center. 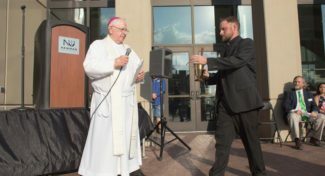 At the dedication, Gerber said he was proud of what Newman does and believed in educating the whole person, no matter what their denominational calling. He also said he liked what he saw in regards to what Newman was doing in the field of science and teaching the distinction between what is possible and what is right. 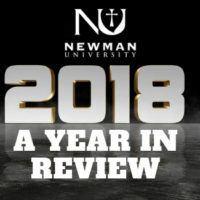 Gerber leaves behind a faith-filled legacy — he will be greatly missed by not just the Newman community, but by a much larger population of individuals who have come to know and love a man who was filled with a passion to serve and help others. An open-casket viewing will take place at Downing & Lahey East Mortuary Sunday, Oct. 7, from 2-8 p.m. and from 1:30-6 p.m. following the noon Mass Monday, Oct. 8, which will take place at the Cathedral of the Immaculate Conception in Wichita. An all-night vigil begins with solemn vespers Monday evening at 6:30 p.m. A rosary will be prayed at 8:30 p.m. Viewing and visitation will be possible until 9 a.m. Tuesday. A Mass of Christian Burial will be celebrated at 10 a.m. Tuesday, Oct. 9, at the Cathedral. Interment will be at 2:30 p.m. at Ascension Cemetery in Wichita. For full details on the service, or to express condolences and share memories, visit Gerber’s obituary online.